This exhilarating piece by the performance group Universes might be a herald of VG’s new era. It’s also badass on its own artistic merits. The arrival of Ameriville at Victory Gardens is big news in a couple of ways. First, it’s a major statement about the Chay Yew Era, as VG’s new artistic director scrapped a previously slated Theresa Rebeck play to slot in this piece, which Yew developed with the performance group Universes. 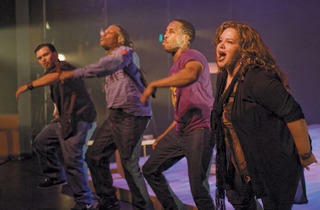 With its youthful brio, forward-thinking dramaturgy and out-front politics, Ameriville feels like a continuation of the path Victory Gardens started down with Ignition, the young-playwrights-of-color initiative spearheaded by associate artistic director Sandy Shinner that’s already produced Pulitzer Prize finalist The Elaborate Entrance of Chad Deity. That doesn’t necessarily equal a closing of the door to the clutch of more traditionalist playwrights who’ve long called VG home—an outcome surely no one wants. But Ameriville seems undeniably to aver a commitment to new forms. More important, the piece is moving, exhilarating, bombastic and badass on its own merits. 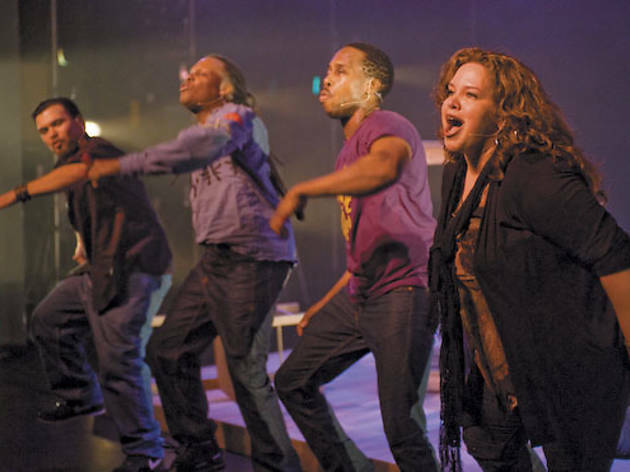 Taking Hurricane Katrina and its aftermath as a starting place, the four members of Universes—Gamal Chasten, Steven Sapp, Mildred Ruiz-Sapp and William Ruiz—stir up a 90-minute meditation in spoken word and song on the state of America’s soul. Developed for the 2009 Humana Festival at Actors Theatre of Louisville, the work is now on a semipermanent tour. Using recurring musical motifs (“How high is the water, momma? Four feet high and rising”) and settings from the Astrodome to Marie Laveau’s crypt, the performers draw a vivid portrait of post-Katrina New Orleans’s molasses-slow recovery. From there, they expand to encompass some of the major social ills facing the country as a whole, from gentrification to homelessness to fracking, conveying information without ever lecturing. The show’s pacing lags in places, and the imagery it invokes—in Yew’s staging, in Brian Freeland’s projections and in Universes’ words—can be unsettling; at times, it may feel like an indictment of modern America. But Ameriville ends on a hopeful, imperative note. If the picture it paints of our modern country isn’t always pretty, it encourages us to get out our brushes and paint a better one.